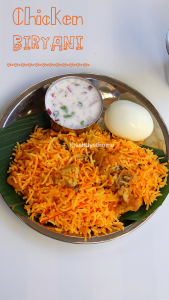 Chicken biryani is a delicious and very flavorful one pot meal that needs no introduction and that needs is adored by all. Chicken biryani can be made in many ways, prepared in any methods but the output always seems to be delish. 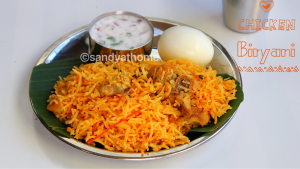 This chicken biryani is one such simple, easy and quick to make recipe prepared in Chennai biryani stalls. 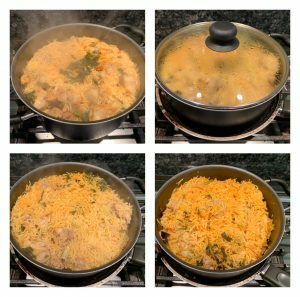 I always wanted to try biryani in this simple stove top method but always kept avoiding for the fear of the result, yes the mushy and soggy rice, which can be related to biryani. But yesterday somehow I gathered lot of courage and made an attempt and turned out to be so good. 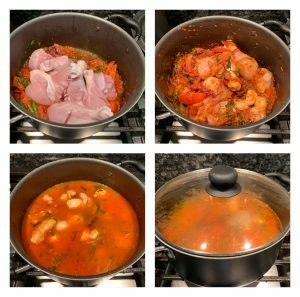 Yes no pressure cooker, no rice cooker and no instant pot needed for this recipe. This simple is very easy to do but all depends on the proper water quantity assessment is very important. You need to be your own judge. So I have added few notes along with making hope that helps all the beginners out there. So lets get to the making! Wash chicken and keep it aside. Wash and soak basmati rice for 20 – 30 minutes. Heat oil in a pan add whole spices in it when aromatic add thinly sized onions and green chili. Saute well. Now add ginger garlic paste to it and saute till the raw flavor goes. Now add sliced tomato, mint and cilantro. Saute well for a minute. Now add turmeric powder, salt and chilli powder. Saute for a minute till raw smell goes. Now add chicken pieces and saute well and add lemon juice. Mix well and cook for few minutes. Now add 4 cups of water. 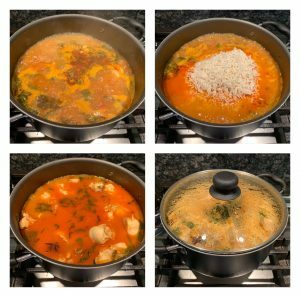 (I added 1:1 ½ ratio rice and water). Since there was little water from the gravy and chicken I added 4 cups of water. 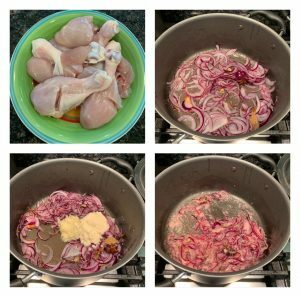 If your chicken looks dry add 4 ½ or accordingly. Measuring and adding right quantity of water is very important. Give it a stir and allow the mixture to boil well. 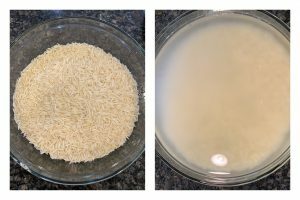 When the water is rolling boil add soaked rice without water. Give it a gentle mix and cover it with a lid and cook for 5 minutes in medium flame. After 5 minutes you find the rice is cooked 50% and looks little dry. Add ghee and cover the biryani pot with a lid. Now place the biryani pot over a tawa and cook for 15 minutes in low to medium flame. My biryani pot lid seals well so I dint place any weight over the lid. (Weight meaning placing a pot of water helps lid to seal tight and cook the biryani evenly.) After 15 minutes when biryani looks done fluff the rice gently from the sides and serve it hot with raita of your choice! If your biryani is not cooked in 15 minutes leave it for some more time till it looks cooked. Wash and soak basmati rice for 20 – 30 minutes. Wash chicken and keep it aside. 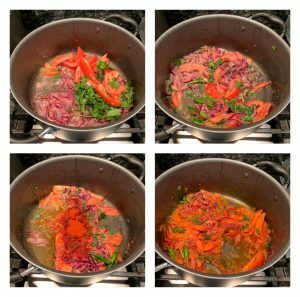 Heat oil in a pan add whole spices in it when aromatic add onions and green chili. Saute well. Now add ginger garlic paste to it and saute till the raw flavor goes. Now add chicken pieces and saute well and add lemon juice. Mix well and cook for few minutes. Now add 4 cups of water. (I added 1:1 ½ ratio rice and water). Since there was little water from the gravy and chicken I added 4 cups of water. If your chicken looks dry add 4 ½ or accordingly. (Measuring and adding right quantity of water is very important) Give it a stir and allow the mixture to boil well. When the water is rolling boil (this stage the chicken will be almost cooked) add soaked rice without water. Give it a gentle mix and cover it with a lid and cook for 5 minutes in medium flame. After 5 minutes you will find the rice is cooked 50% and looks little dry. Add ghee and cover the biryani pot with a lid. Now place the biryani pot over a tawa and cook for 15 minutes in low to medium flame. My biryani pot lid seals well so I dint place any weight over the lid. (Weight meaning placing a pot of water over the lid helps the lid to seal tight and cook the biryani evenly.) After 15 minutes when biryani looks done fluff the rice gently from the sides and serve it hot with raita of your choice! 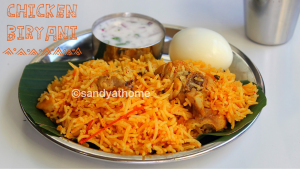 If your biryani is not cooked in 15 minutes leave it for some more time till it looks cooked.